Although certain countries in the world pressurize smaller nations to display their might, China always lends its co-operation towards both big and smaller nations by extending its hand of friendship to them. 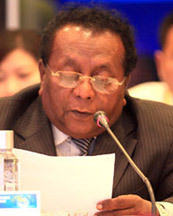 "The economic strength provided by China towards developing countries like Sri Lanka is highly laudable and as a Sri Lankan, I highly value and appreciate the unprecedented co-operation and support extended by China towards development activities in Sri Lanka," said Associated Newspapers of Ceylon Ltd Editorial Director Seelaratne Senarath participating in the BOAO conference held in Hainan, China recently. The conference was held in 2001 China with the participation of 28 countries in South East Asia. Heads of state of eight countries attended each annual BOAO conferences. President Mahinda Rajapaksa and former Prime Minister Ratnasiri Wickremanayake too have attended the conference in the past. This year's conference presided by Chinese Prime Minister Li Keqiang was attended by Heads of state of Australia, Korea, Vietnam, Laos and Cambodia. The media seminar of this conference, organized by China International Radio (CRI) was presided by its Director General Wang Gin Nian. Senarath added that steps taken by China to reintroduce its Silk route concept under new characteristics was most praiseworthy. New strategies had to be adopted in conducting the media in the modern age. 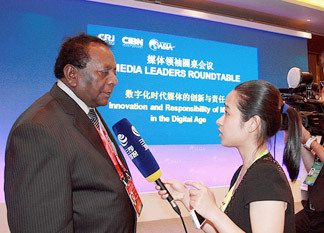 ANCL Director Editorial Seelaratne Senarath being interviewed by the China Radio International (CRI). "Although we use new media trends like SMS, Internet and facebook, we cannot totally forget the traditional methods. Therefore, we have to use a mixture of both traditional and modern methods," he said. China International Radio reached listeners in nearly 160 countries by using 65 international languages. Exchange of news and messages was vital for the development of a country. China International Radio has been able to transmit important messages throughout the world through its media strategies, he said. He added that China is a giant in the world who has now awakened. But that giant was not causing any annoyance to the world. Instead it assisted and lent a helping hand to countries trying to rise up in the world. President Mahinda Rajapaksa had taken steps to further strengthen and cement the mutual friendship and relations between Sri Lanka and China, and this was a most noteworthy feature. China had always offered strength, co-operation and encouragement to Sri Lanka in time of need, he said. Senarath said Associated Newspapers of Ceylon Ltd was the leading newspaper institution in Sri Lanka. ANCL which had its beginnings 100 years ago during the lead composing era, had changed over to the use of computer printing in 2007. Today it had the capability to produce E newspapers too. Concurrent to the development of printing technology, ANCL had also achieved much progress in journalism. ANCL too was a shareholder of the endeavour to introduce the new Silk Route concept to the world, he said. Media heads from China, India, Pakistan, Jordan, Laos, Cambodia and Australia also addressed the media conference.